Very close to metro and direct line to Barceloneta (about 15 mins). Very well equipped apartment. Sehr schönes, zentral gelgegenes Appartement mit sehr gut ausgestatteter Küche! Très bon appartement , à 15 min de métro du centre , je le conseille vivement ! 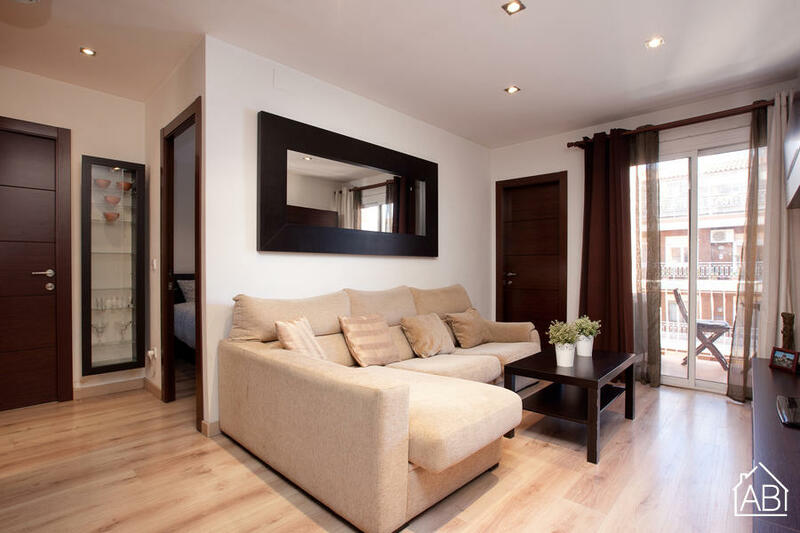 This comfortable apartment for four people is located in Horta-Guinardó, one of the largest districts in the city. The area is in the northeast end of Barcelona and is one of the most tranquil parts of town. This apartment is surrounded by beautiful mountain ranges and steep hills where you can see the best views of the entire city. This two bedroom apartment has excellent décor making you feel right at home. There is a spacious living room with a comfortable couch with chaise longue and a TV. Right next to the living room, you will find a patio with a great view where you can enjoy your morning coffee. One bedroom has a double bed while the other has one single bed. There is one bathroom. The homey-style kitchen comes fully equipped with all appliances necessary to cook a delicious meal. This apartment is great for friends or family looking for a relaxing weekend in Barcelona close to the most beautiful views of the city.